Writing Careers What is the Best Copywriting Course? 100% FREE and 100% Online! Nothing to Download, No Email Required! Every month, we get a deluge of questions from people looking to upgrade their skills by taking a copywriting course. Most of these requests come from people like you who have a very specific reason (usually one of three reasons you’ll see below) for wanting to find and evaluate the best copywriting course out there. And it’s no wonder. With the massive amount of copywriting courses, books, programs, and workshops advertised, it can be difficult to know which one to choose. The entire guide is published right on this page. There’s nothing to download and no form to fill out. I want a copywriting course that will help me perform better in my copywriting job. Most people who look into a copywriting course do so because they fall into one of the three categories above. If any one of those statements describes you, this Buyer’s Guide is for you. To begin, we can’t stress enough the importance of taking sufficient time to closely examine the program curriculum. The curriculum gives you the blueprint of everything you will be learning. As you review the curriculum of any copywriting course, ask yourself, What is the publisher of this program promising me? 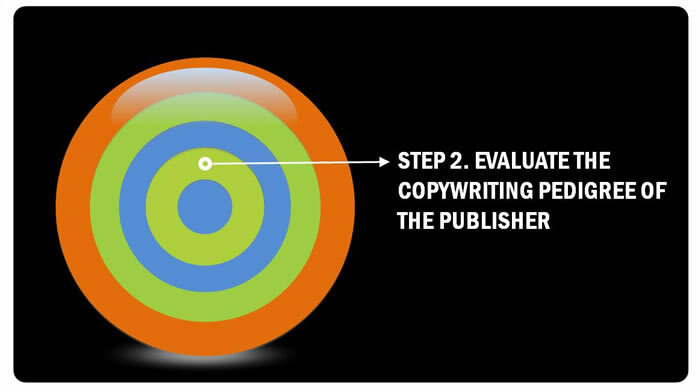 For example, the AWAI copywriting program is called AWAI’s Accelerated Program for Six-Figure Copywriting and our promise to anyone who takes the program is that upon completion of the program, you will have what you need to write persuasive direct-response copy. Some copywriting courses and programs make similar promises, even though not all of them live up to the hype. A thorough examination of the program’s curriculum is the best ‘gut check’ way to assess the value of what you’re purchasing. As an example, we’ve included the entire curriculum summary for AWAI’s Accelerated Program for Six-Figure Copywriting right here on this page. It’s 8 screens of detailed descriptions of the 13 Modules that make up the program. In Module 1, you'll learn the basics for getting started as a direct-response copywriter. But just because this is 'foundational' work doesn’t mean it lacks substance or usefulness. 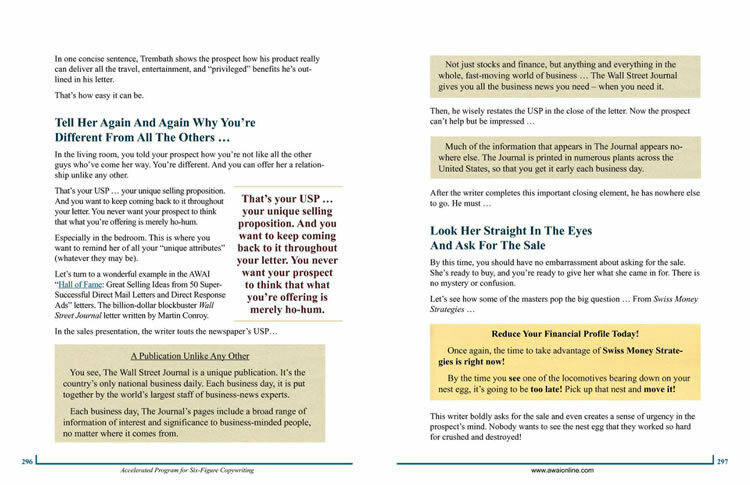 On the contrary, the fundamentals you discover in this section are the key copywriting techniques that you'll weave into virtually every piece of direct-response copy you ever write! Mark Ford's Tips for POWER WRITING! 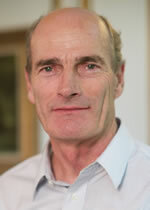 In Module 1, Mark Ford teaches you How to Sell Anything, and explains in detail the Three Fundamental Rules of Selling. 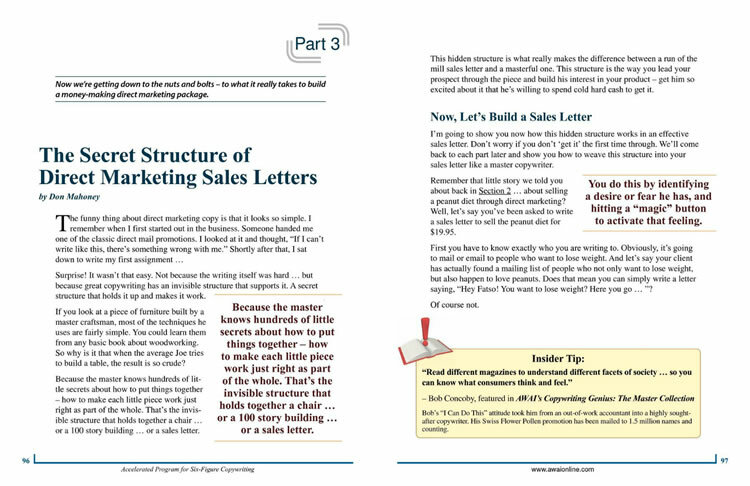 In Module 1, Don Mahoney teaches you The Secret Structure of Direct Marketing Sales Letters — and shows you exactly how to build these letters for maximum conversion in print and online. The truth is, you could stop reading after Module 1 and you’d know more about direct-response copywriting than 50% of the working copywriters out there today. But this program is about teaching you the same secrets used by the top direct-response pros in the world. So the learning is just getting started! In Module 2, Mark Ford explains The Myth of You and reveals the Two Powerful Principles of Selling. The craft of copywriting is loaded with some mind-bending myths. And some are so counterintuitive — that, for the novice, trying to write a direct-response letter without knowing myth from reality is like walking through a minefield in the desert. Real-world examples of the use of the emotion Curiosity, one of the many powerful human emotions that are dissected and analyzed for the purpose of direct-response copywriting in Module 3. The copywriting techniques taught in Module 4 really are top-secret in the sense that you won’t find this particular collection of persuasive writing secrets covered in any other copywriting program. What are these three techniques? In Module 5, you'll take a deep dive into learning how to write headlines, subheads, and hooks. 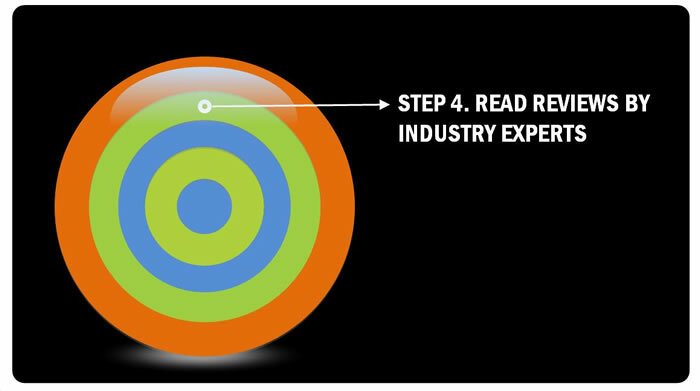 These are the key elements of your copy that jump out at the reader, and cause him or her to pay attention. Botch any of these three critical components of a direct-response letter, and it simply won’t get read. 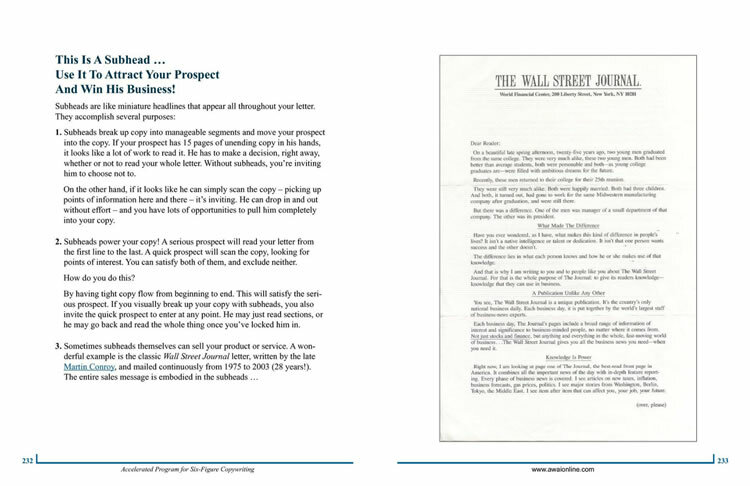 This section from Module #5 shows you how to write subheads that attract prospects and win business. Module 6 builds upon the "structure" of direct-response letter (that same structure you learned back in Module 4), but adds in some subtle nuances that make your writing irresistible to the reader. One of the subtle nuances of direct-response copywriting taught in Module 6 is how to skillfully communicate a USP more than once in a single letter. Module 7 focuses solely on the ALL-IMPORTANT Close. Pay close attention to the techniques contained in this Module. Not knowing how to close the deal means — quite simply — that your copy will not make a sale. Module 7 shows you how to close the deal like a master. "It isn't enough to just 'sell' your prospect. You've got to reassure her, and make her feel good about her choice." 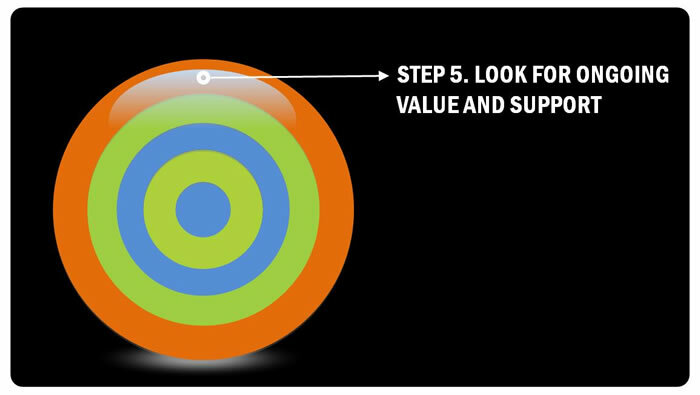 That piece of sales wisdom comes right from the opening of Module 8. 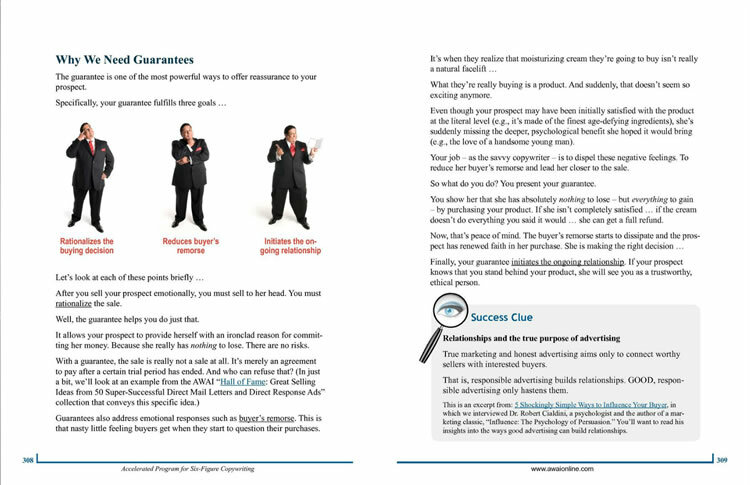 This section of Module 8 illustrates for you the psychology behind why you need guarantees in your copy. MODULE 9: Ready … Set … Write! This Module helps make sure you don’t get STUCK! Up to this point in the program you’ve covered more than THREE HUNDRED pages and absorbed dozens of strategies and techniques known only by the best copywriters in the business. It’s understandable that your head might be swimming! But Module 9 shows you how to sit down and prepare to write a sales letter like a pro, so you’ll never find yourself staring at a blank computer screen, not knowing where to begin. 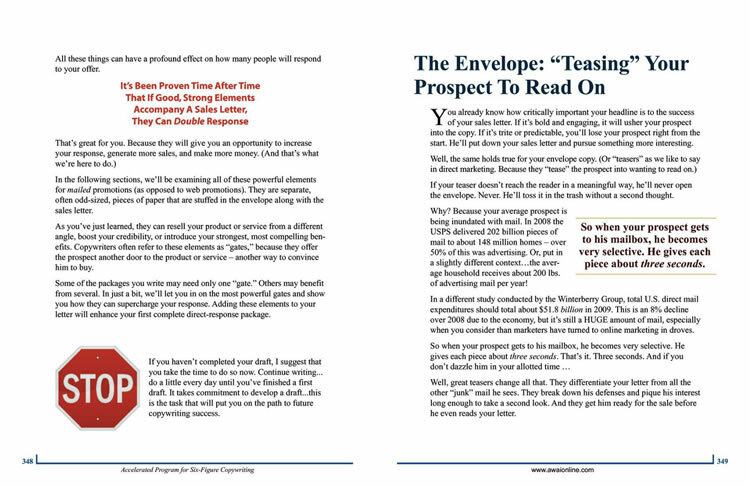 Module features a section on the importance of writing effective Envelope Teaser Copy, and includes a dozen different examples to learn from. More than ever, today's buyers want proof before they buy. Even if the buyer is highly motivated to purchase your product or service, you need to seal the deal with well-written testimonials, endorsements, and lift notes. 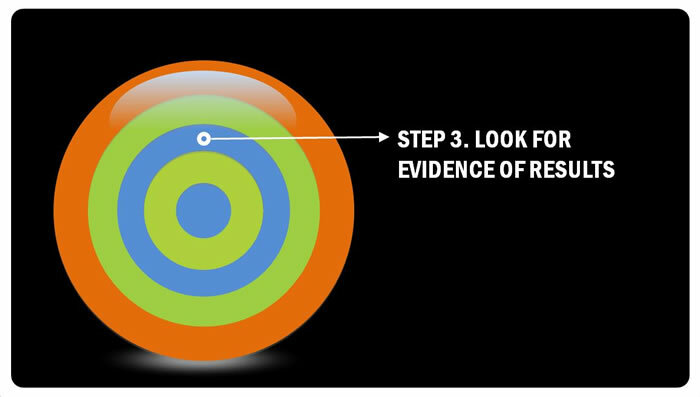 Module 10 shows you how to use these essential elements of “social proof” properly. 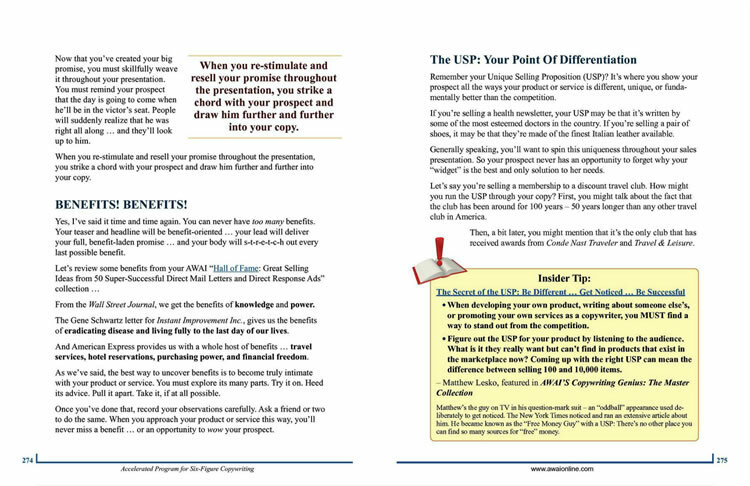 Module 10 features detailed instruction on how to write effective, sales-boosting Lift Notes and other techniques for filling your copy with social proof. Just in case you think the value of the content in such a comprehensive copywriting program might begin to taper off toward the end, think again! 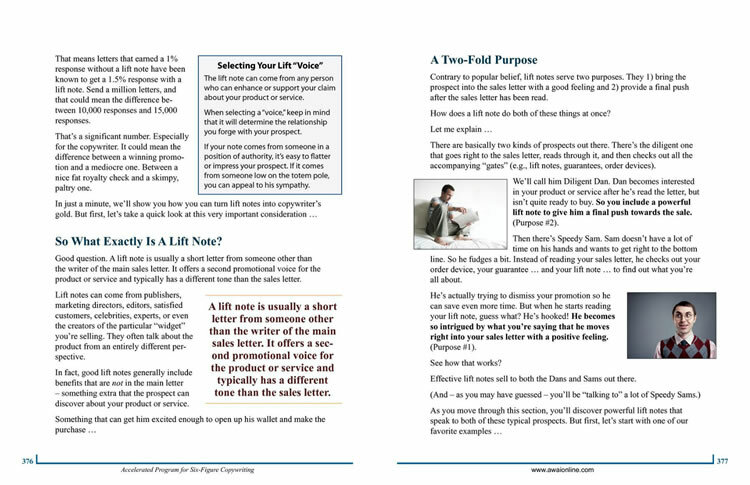 Module 11 is PACKED with helpful information that shows you how to edit, polish, and present your copy to clients. But that's actually the second part of this Module. The first part of Module 11 actually teaches you yet another proven technique for boosting the effectiveness of your copy — with a detailed section on the use of premiums in your offer. Premiums — what are they and when should you use them? Module 11 covers every imaginable detail for impressing clients, right down to the kind of font to use in your submitted draft! The greatest copywriting legends of our time share one common trait — they’re ALL absolute master storytellers. The good news about this, for you, is that the ability to tell a good story is an entirely learnable skill. And you’ll learn it in this Module. Storytelling use in persuasive copy: How far is too far? This Module encapsulates some of the greatest storytelling teachings from copywriting masters past and present — and teaches them in a way that's easy to learn and apply. MODULE #13: You’re a Copywriter! Well, here you are — at the very last Module of the program. More than 500 pages covered so far! And still LOTS of juicy strategies to learn about how to market and sell yourself so you land more business. This Module is dedicated to helping you put your best foot forward and land paying copywriting gigs! 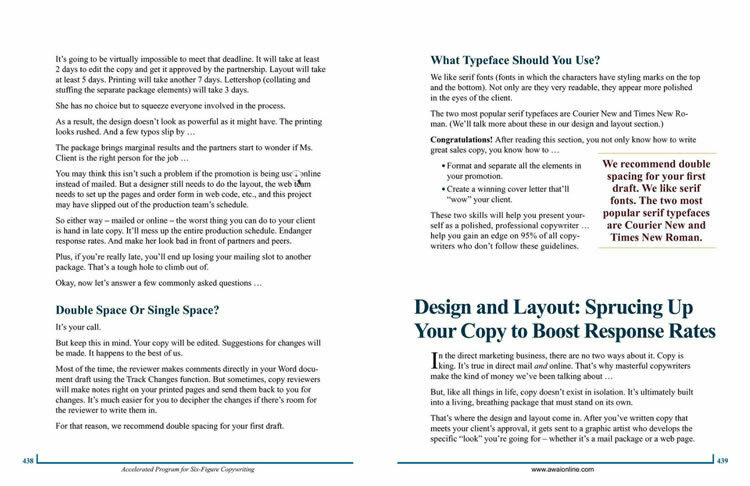 Module 13 is packed with tips and strategies to help new copywriters land clients! To be honest, most people who are ready to invest in a copywriting course skip this part of the checklist, usually because they’re not aware of its importance. But before you invest in any skill-building course or program, isn’t it wise to first take a look at the track record upon which the program is based? It’s not enough to look at who is behind a particular copywriting course, program, workshop, or even book. What’s important is examine the pedigree — the track record — of the people behind the program. A workshop (live or virtual), put together by someone who had success in one or two ventures and has now added copywriting workshops to their own income stream. A book on copywriting which, though well-written, includes distilled overviews of copywriting techniques, but not enough detail to actually impart the knowledge that you will need to make a discernable improvement in your copywriting skills. A copywriting course at a college, which pulls bits and pieces of copywriting theory and jargon from lots of different sources, each with various degrees of pedigree. The pedigree of the publisher of any program you invest in should be up-front and easy to spot. If it isn’t, take it as a red flag. AWAI’s Accelerated Program for Six-Figure Copywriting is built upon the combined pedigree of some of the most accomplished copywriting legends in the world — all of whom are members of the AWAI Board of Advisors. Mark Ford’s indoctrination into the world of copywriting began three decades ago at a small newsletter publishing company in Boca Raton, FL. After taking that company to over $100 million in sales, Mark "retired" for a few years to focus on fiction writing. He came back out of retirement to work with the writers and marketing at Agora Publishing∇… helping it to grow from a fledgling $8 million company into one of the largest direct-response publishers in the country today — with over $400 million in sales (and always looking for new writers!). Mark has turned several other direct-marketing ventures into multimillion-dollar companies as well. He has been directly involved in the generation of over ONE BILLION DOLLARS of sales through the mail and online. Mark is also a highly-successful author. He’s published more than a dozen books, including several which have become Wall Street Journal, Amazon.com, or New York Times bestsellers. Why is Mark Fordn’s track record important to you? Because AWAI’s Accelerated Program for Six-Figure Copywriting contains the very same strategies that have generated billions of dollars in sales for companies around the world. Copywriting techniques and strategies that have been proven to work in virtually any industry, in up economies, down economies, and general market conditions of every kind over the past thirty years. Bill is the founder and president of Agora Publishing, one of the world’s most successful consumer newsletter publishing companies, and the author of the free daily email The Daily Reckoning. 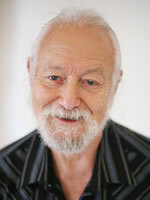 Bill is the author of several best-selling books, including Financial Reckoning Day, written with Addison Wiggin, and Mobs, Messiahs, and Markets, written with Lila Rajiva. A true copywriting legend, Bill Bonner has set the standard for “Big Idea” copywriting. 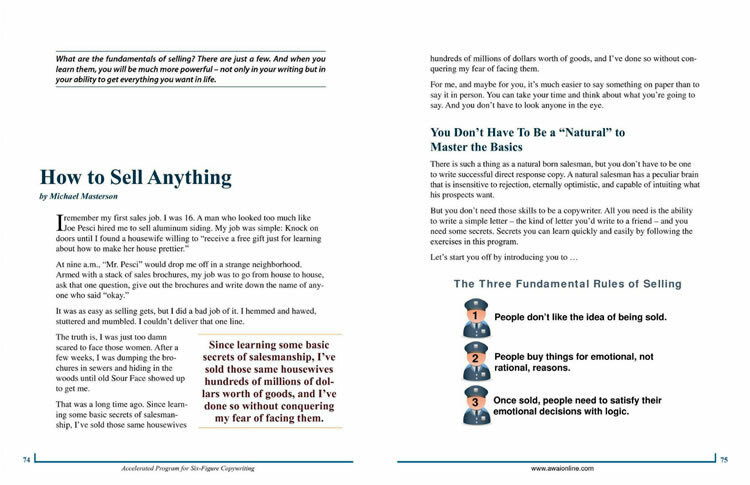 In AWAI’s Accelerated Program for Six-Figure Copywriting, he reveals, among other things, his secret of “indirection” … a copywriting technique that keeps your reader glued to the page by leading him seamlessly through a series of persuasive and compelling ideas. 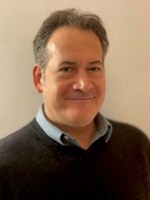 Bob is an independent copywriter and consultant with more than 25 years of experience in Business-to-Business, high-tech, industrial, and direct marketing. Publishing giant McGraw-Hill calls him “America’s Top Copywriter” and one look at his pedigree tells you why. Bob is the author of more than 80 books including The Complete Idiot’s Guide to Direct Marketing (Alpha Books) and The Copywriter’s Handbook (Henry Holt & Co.). His articles have appeared in numerous publications such as DM News, Writer’s Digest, mtrak Express, Cosmopolitan, Inside Direct Mail, and Bits & Pieces for Salespeople. John has been writing winning controls for going on two decades. He’s made untold millions for clients in the financial, health, and travel industries. John also works as a copy coach, hosting intense seminars for two or three hundred marketers and copywriters at a time. He’s directly mentored dozens of successful writers and has led or helped lead international copywriting training programs, seminars, and bootcamps in London, Paris, Bonn, Warsaw, Baltimore, and Delray Beach, Florida. John is also the founder and publisher of The Copywriter’s Roundtable, one of the most popular and widely-read e-newsletters for copywriters. Will started out in the field of chemistry, doing research work in a lab. However, he wanted a career that would provide him with more connections with people. He became an apprentice to Lee Troxler, a renowned copywriter, and set off on the path to career freedom through copywriting. 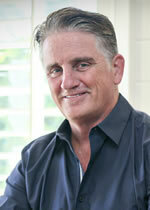 For more than a decade, Will has worked as a professional copywriter in many different industries. His varied background makes it easy for him to transition from technical industries to other industries like fundraising. 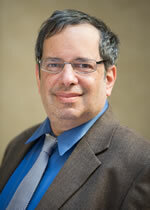 He is also a copywriting coach and provides critiquing services for other copywriters. Will is a regular contributor to AWAI publications for copywriters and a long-time presenter at our annual Copywriter’s Bootcamp. 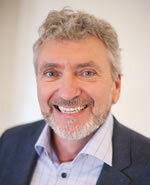 Paul is a co-founder of AWAI. In 1994, while working at a Publix supermarket stocking the shelves, he answered an ad for a direct-mail copywriter and met Don Mahoney and Mark Ford. Although he knew nothing of copywriting, he worked under Mark and consulted with Don on his first project, which brought in over a million dollars and launched his career. Paul now leads a truly transformed life as one of today’s most sought-after copywriters … earning over $300,000 a year from just one client. In AWAI’s copywriting program, Paul reveals his specialty … exactly how to make that all-important emotional connection with your reader. Paul lives in a little historic town in the Vermont countryside, where he continues to produce control after control … living the dream life of a freelance copywriter. If you’re considering investing in a copywriting program for yourself, it’s very likely that you will first want to see evidence that others who have taken the program have achieved results. Note that in this Step 3, you’re not looking for a guarantee of success (nobody can make a promise like that and mean it) but you are looking for plenty of examples — not just two or three — of other people who have achieved results with the program. the transferability of the knowledge contained in the program. If you see plenty of evidence of other people who have taken the program and enjoyed success as a direct result, that’s your indication that the quality and transferability of knowledge is there. Every week, we hear from AWAI members who are using what they’ve learned in the Accelerated Program for Six-Figure Copywriting, to land a great copywriting project, or improve sales of their own products. When promoting the program, we sometimes include two, three, five, or more pages of such success stories. It’s not because we like to brag! It’s because we know that people who are considering investing in themselves want to see proof that the course material actually works. "I TAKE JUST ONE CLIENT AND PULL IN $6,000 – $8,000 A MONTH … "
“None of this would have been possible if it weren't for AWAI. 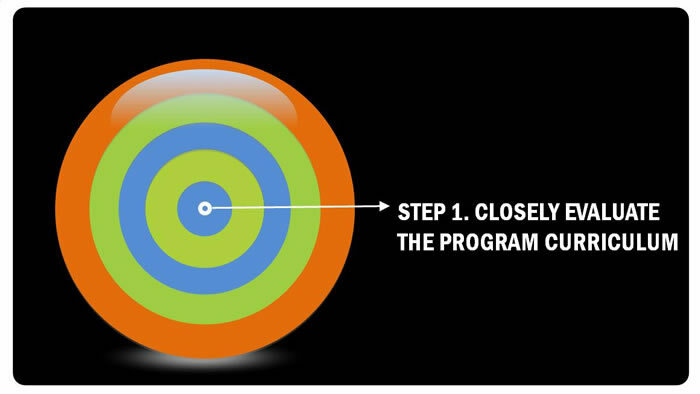 “Making the decision to take the Accelerated Program for Six-Figure Copywriting has allowed me to meet and work with legendary clients and heroes of mine such as Zig Ziglar and Glazer-Kennedy Insider’s Circle and Dan Kennedy. In fact, I did a year-and-a-half project with Ziglar and am currently one of only two contracted copywriters for Glazer-Kennedy Insider’s Circle. “Most of my clients need so much work done, that I have six month to one-year agreements with them, many of which renew. As a result, in a time where many people are taking pay cuts or, if they’re lucky, receive a 2-3% raise, my income continues to see tremendous increases year over year. Last year, I tripled my income and I’m on track to double it again as of January this year based on the business I’ve already contracted for the year — even if I don’t add any additional projects the rest of the year. “Within six months of starting AWAI’s program, I landed a $60,000 contract and once I established myself, I’ve found it very easy to get clients and ongoing work — in fact, it is not uncommon for me to receive between 1-3 referrals for new business every week. CLIENT PROJECTS TOTALING $14,000 IN ONE MONTH — AND ALL FROM LINKEDIN! “In April 2009, after 34 years in nursing, my department was dissolved in the wake of the crashed economy, and I was laid-off. The company director said all the usual nice things, thanked me for my contributions, and wished me well. 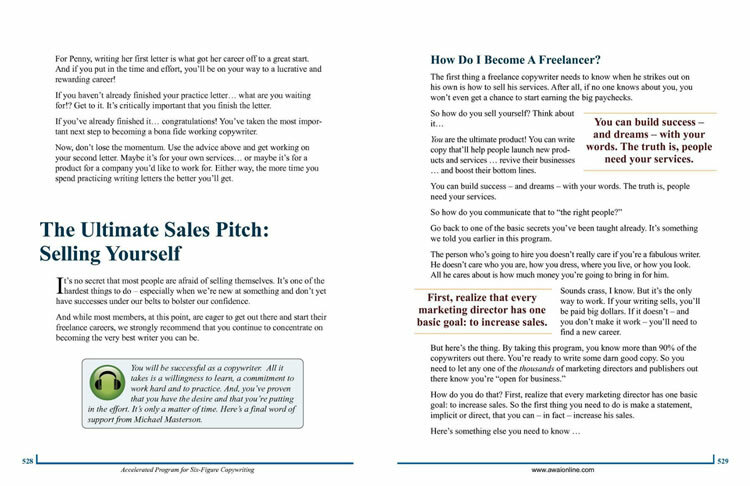 “As soon as I was laid-off, I ordered the Accelerated Program for Six-Figure Copywriting. I loved it. “In those pages, I learned how to woo the prospect. I learned how to talk to her about her wants, needs, desires, and pains in words that resonate deeply and draw her in to engage in the content. It was about building trust … gently compelling her to do what we want her to do … such as call for an appointment, or pull out her wallet and buy. “I’ve also learned how to write effective headlines that hook the reader’s interest. 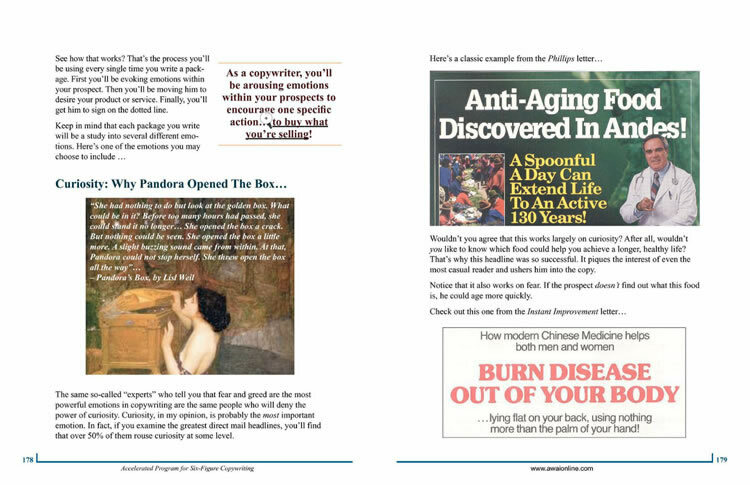 Headlines that utilize the 4 U’s® effectively. “I’ve been involved with providers in my niche on LinkedIn over the past year, and have offered suggestions to the concerns they’ve raised about marketing their practices and their books. “It’s exciting to report that I’ve been approached by mental health leaders, frontrunner psychologists, and psychotherapists who’ve authored books, written columns in international magazines, and who speak to Congress about crucial issues in this field. “These comments by clients and prospects have shown me the outstanding quality of training that AWAI produces. And the Accelerated Program is the beginning and the core of that training. “Having spent over a decade writing direct mail and customer acquisition materials for a roster of clients in the banking industry, the crash of the financial industry was an unpleasant experience. Thankfully, all the training I’d received in persuading prospects from AWAI’s Accelerated Program for Six-Figure Copywriting could be easily applied to a new niche. Using the fundamental rules for selling, the formulas for effective headlines, and the closing techniques from that program, I was able to start over writing for companies I like and buy from! 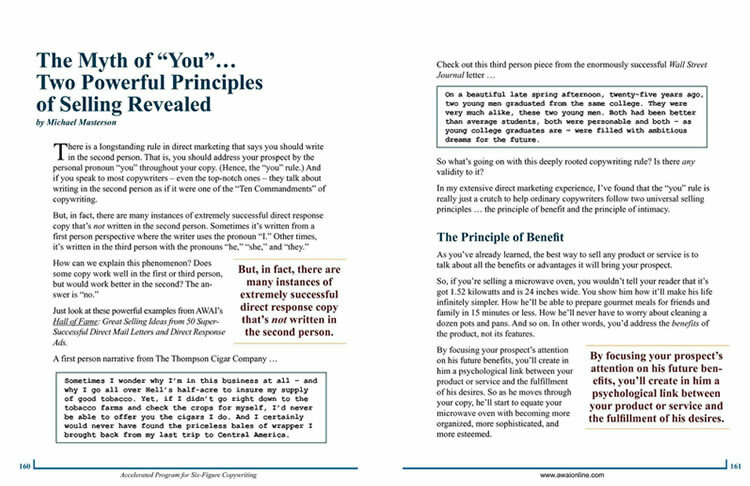 “When I discovered the Accelerated Program for Six-Figure Copywriting, I had my doubts. I didn't know a single person who called themselves a copywriter, and I wasn't entirely confident that an online correspondence-type program could deliver. “I'm happy to report that my doubts were quickly erased. Within two years of completing the program, I launched my full-time freelance business. The Accelerated Program gave a beginner like me a solid foundation in the art of copywriting. But it also taught me more advanced skills like the Principle of Intimacy and 3-Step Copy Cleaning System that most professional copywriters don't even know. “More important than the skills, it gave me the confidence to go after, and land, some pretty good clients. 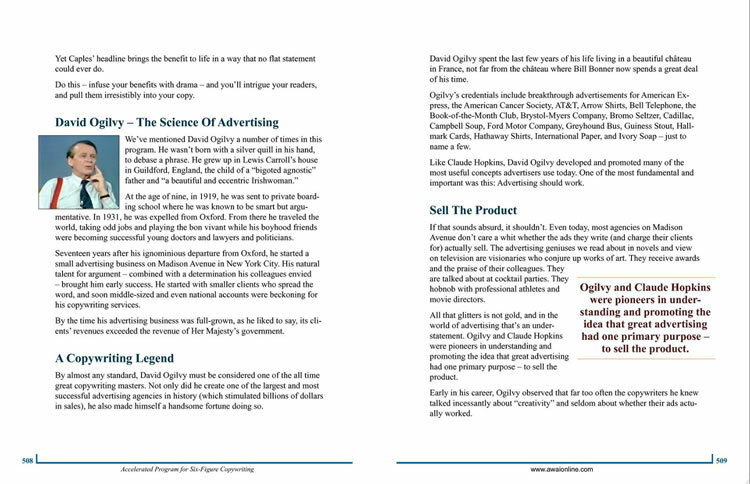 I had the chance to work with master marketer and best-selling author Dan Kennedy on a copywriting project. For over two years now, I've been the main writer for a chain of fitness studios in southern California, helping them grow their customer base by 157% and double their locations. "I'VE MULTIPLIED MY INCOME 5 TIMES … "
“Before I discovered copywriting, I was the guy at the utility company who answered the phone when you called to argue about your bill. Or when your service had been shut off because you didn't pay. (Not YOU, of course!) In the seven or so years since then, I've multiplied my income more than 5 times ― and I work from home or the local coffee shop. “I now work exclusively with Casey Research, a highly-regarded investment newsletter publisher. I chose investment writing for a couple of reasons. First, the money — it's one of the biggest and highest-paying niches within direct-response publishing. And second, I'm genuinely interested in investing and the financial market — it fascinates me. I went from a freelancer working with them on a per-project basis to Copywriting Creative Lead and acting as ‘Copy Chief’ for their entire team. “This role lets me help define the marketing for their brand — while giving me a lot of personal upside as I help the company grow. “If you want to be successful in financials or any other field of copywriting, you have to dedicate yourself to learning the fundamentals of what works in direct response. AWAI — and their huge network of experts — helps you fast-track that learning process. And believe me — the world needs good copywriters. I'm regularly getting recruitment letters from various financial publishers interested in paying me well to write for them. "A FOUR-FIGURE CONTRACT RIGHT OUT OF THE GATE … "
“If you want to become a freelance copywriter, there’s no better training than the Accelerated Program for Six-Figure Copywriting. “I was actually working as a staff copywriter when I decided to go freelance. But even with my experience, I wasn’t sure I had the skills to succeed. The Accelerated Program made all the difference. “Not only did it teach me advanced direct-response techniques that immediately made me a better copywriter, it gave me the confidence I needed to start a thriving freelance business. “In fact, my very first sales letter got me a four-figure contract right out of the gate. And by applying the techniques taught in this Accelerated Program, every project I’ve taken on has been a winner. “Now, I stay busy with direct response and web copywriting projects. And after little more than a year of freelancing, I even have potential clients calling me out of the blue to find out if I’m available. Why All the Success for AWAI Program Members? As these testimonials show, you can make a very good living as a copywriter. But you may also be interested to know that AWAI offers many opportunities to connect with real clients once you’ve taken the program through their NETWORK of clients. The truth is, most people who want to take a copywriting course will be very close to making the decision after they read enough success stories of others. But for those who want even more evidence of how one copywriting program stacks up against others, the next step is to look at the opinions of credible industry experts. When evaluating a copywriting program, find out if it’s been reviewed not just by people who have taken the program, but by seasoned industry professionals — those people who are at the very top of the copywriting industry. People who know not only a good program from a bad one, but can spot a truly superior copywriting curriculum when they see one. Maybe you yourself don’t quite have the experience to truly know which copywriting course is the best. That’s all the more reason that you should take the opinions of credible industry professionals into account. We’re fortunate that many of the most notable names in marketing and copywriting, from Bob Bly to Copyblogger to Dan Kennedy to Clayton Makepeace to Yanik Silver have taken the time to review AWAI’s Accelerated Program and agree that it’s the best there is. “The simple fact is, AWAI’s Accelerated Program for Six-Figure Copywriting is hands-down the best way I know to get a working knowledge of the world’s most effective copywriting techniques today. With many copywriting programs of this nature, once it’s over, it’s over. You’re on your own, and left to fend for yourself. There’s no ongoing support, no continuous source of motivation, no group of friends to stay in touch with in a formalized manner and definitely no network of industry professionals who actively post jobs and hire people who took the workshop (or read the book) year-round. As a member of AWAI’s Accelerated Program for Six-Figure Copywriting, you’ll immediately start receiving your FREE subscription to The Golden Thread — our weekly e-letter featuring writing tips, advice, and success stories. It’s a constant stream of practical knowledge and new wisdom delivered right to your inbox every week. You’ll also be given access to AWAI’s Members-Only Website. Check out the latest job list … get answers to questions you may have … and search the over 1,500 articles archived there. BONUS #5: ACCESS TO MEMBERS-ONLY ONLINE JOB BOARD! DirectResponseJobs.com, our exclusive Online Job Board, where marketers and writers come together. As I said, AWAI is more and more becoming the place the industry turns to for copywriters to write the volume of letters that need to be written. And with the industry’s demand for copywriters growing — and the reputation of our program and the members who complete it getting stronger — we knew we had to provide a way for marketers to place their job ads one day … and have a writer in place the next. DirectResponseJobs.com was the result. As an AWAIer, you’ll have full access to this service — and it’s free! Because the copywriting industry is always changing, when you buy this Program, you get updates to course material — FOR LIFE! This is your guarantee that you stay up-to-speed on the latest developments in copywriting — such as web copywriting and writing for hot niche markets — as we add these updates to the curriculum. Anytime an update is added, you get access to it, FREE. There you have it. 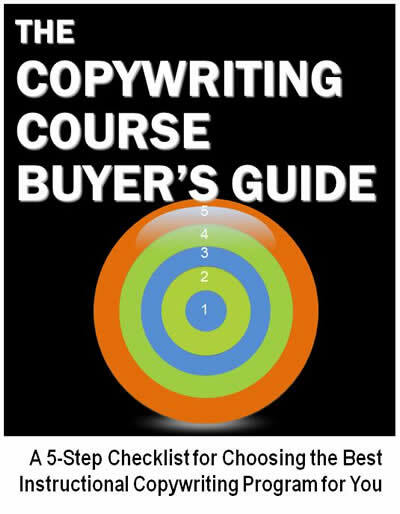 We hope this detailed Buyer’s Guide has helped you answer all the questions you had about selecting the copywriting program that’s right for you. If you compare the AWAI program with any copywriting course out there, you may agree with Copyblogger, Bob Bly, Clayton Makepeace, and other copywriting experts that this is simply THE best program to take if you want to learn to write persuasive copy. If it’s not for you, let us know and we’ll simply (and immediately) deactivate your access code and refund your $99.40 — no questions asked. But if you want to continue with your copywriting training beyond the 30-day “try it out” period — and take advantage of all a lifetime of program updates, interactive learning opportunities, and ongoing access to writing jobs and industry news that are included — simply do nothing and we’ll elevate you from “provisional” to “full-time” copywriter status for a mere $397. In other words, for a total of $497, you can be well on your way to learning and mastering a skill that can transform your life — and your income — in so many ways. If you decide it’s not for you, let us know and we’ll refund your $99.40 in full — no questions asked. If it’s not everything you imagined — or if you happen to decide copywriting just isn’t for you — let Member Services know within that year and we’ll send you all your money back … all $497 of it … no questions asked. Then take a full year to see if “the writer’s life” is for you — again, with absolutely zero risk.